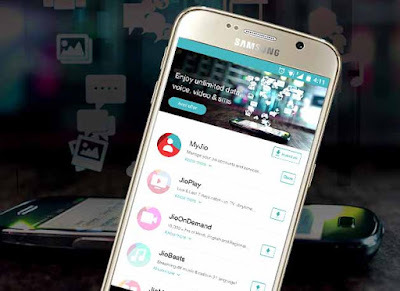 Jaipur : Ahead of its commercial launch, Reliance Jio is now available on all 4G smartphones of Samsung and LG. Reliance Jio, which is currently doing beta testing, was previously available bundled with its own LYF mobiles. The service was then extended to a small range of Samsung smartphones. Now it is available on all 4G smartphones of Samsung and LG, sources said. Under Jio Preview Offer, all customers of 4G smartphones of Samsung and LG - which together account for a huge share in the devices market - will get an opportunity to test Jio services. Customers need to submit their KYC documents at the time of purchase of their devices to avail of the Jio SIM under this offer, they said. As part of the offer, users will get unlimited HD Voice calls and video calls, unlimited SMS, unlimited High-Speed Data and a host of Jio premium apps such as Jio Play,Jio On Demand, Jio Beats, Jio Mags, Jio Xpress News, JioDrive, Jio Security, and Jio Money. The offer is valid for a period of 90 days from the activation of the Jio SIM.Jio Preview offer is part of the test phase of Jio services, which was initially launched for employees and was later extended to family and friends, partners, and vendors. The offer has been progressively opened up for LYF smartphone users and those of select models of Samsung smartphones. Lately, Jio Preview Offer was made available with Jio Fi (the Wi-Fi hotspot device) at Reliance Digital, Digital Xpress, and Digital Xpress Mini stores.